Seifer Almasys Hyperion Gun Blade. Now at this juncture, I suppose you’ll be wanting me to actually qualify the opined ultimacy of this here gunblade. I would be extremely happy to oblige. 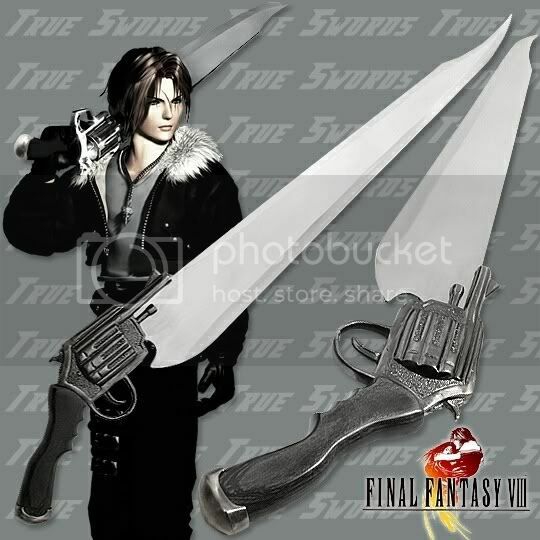 First, the hyperion blade is, imho, a much cooler design than Squall’s Gunblade. In contrast to the curved lines of Squalls gunblade, The Hyperion Gunblades transitional areas all seem to terminate in corners or wicked points. This gives it a much more sinister appearance. If you have been reading my blogs for any amount of time, you should have figured out that this is a great big plus in my book. Now if that wasn’t enough, take a look at the type of firearm the blade is attached to. A pistol! Yes, ladies and germs, the Hyperion Gunblade is a giant sword with an automatic pistol attached, as opposed to Squalls gunblade, which is attached to a revolver. Now I have mentioned before that I am a fan of weapons in general, and firearms are no exception, so allow me to provide a little insight as to why I feel that a pistol-based Gunblade is a superior combat weapon. It is true that, from at least a zen perspective, a revolver might appear to be better, since they do not rely on large magazine springs or highly complex mechanisms, are simpler, more robustly designed and therefore generally more reliable. HOWEVER, a pistol can generally carry more ammo than a revolver, (usually 50%-100+% more), can be designed for full automatic fire, and can be lighter and smaller than a revolver for any given caliber. I think these qualities outweigh the potential pitfalls, and make it a shoe-in for total combat dominance. Hence the “Ultimate” title. What? Don’t believe me? Look it up, buster. Don’t make me bust a cap in yo… Oww… that really hurt! Sheesh! No pinching! Now here we are presented with a unique combination. I have in fact seen a similar, more realistically scaled combination before, however this one is definitely more commanding. 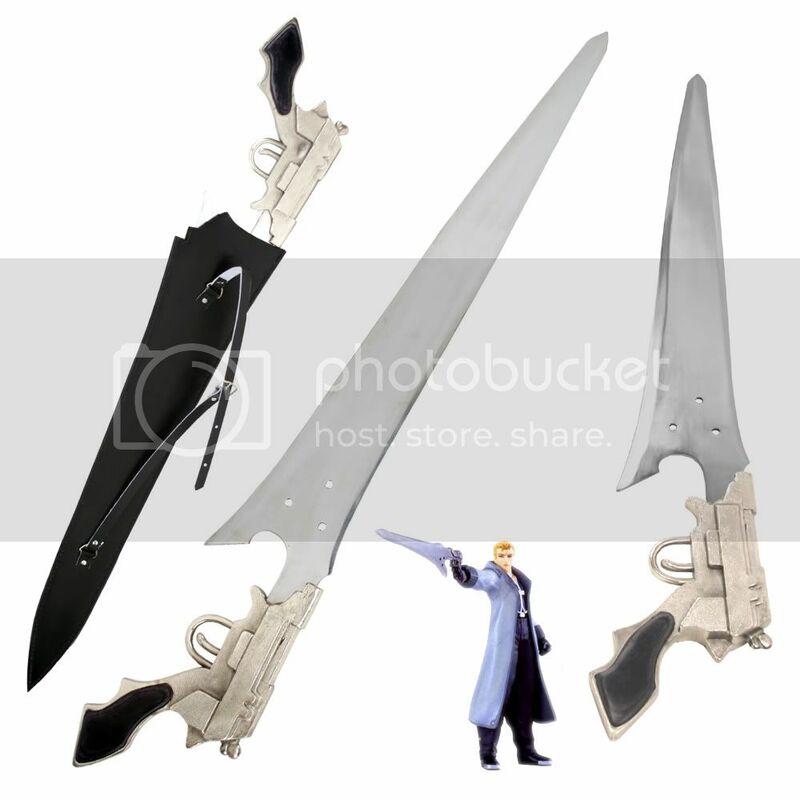 It is essentially another large sword, 30″ to be exact, but this time attached to a revolver, which acts as both the gun stock and the sword grip. Or is it a large caliber revolver with an over sized, permanently fixed bayonet? Either way, it isn’t exactly a conventional bladed weapon, but then few of the weapons I post about will be particularly standard.